d. There are numerous options — from a perimeter path to a reservoir route with great skyscraper views to woodsy sections to grand allées. This woodsy getaway offers plenty to look at; from spring-blooming cherry blossoms and Manhattan skyscraper silhouette in the horizon, to sightings of world-class runners and movie celebrities. There is a huge number of other runners of all speeds along with tourists, dog-walkers, bikers, cars and horses. Thus, it is also useful to know Central Park runner etiquette. The innermost / left lane is for those running clockwise, the “middle” lane for those running counterclockwise and outside/right lane of the road is for cyclists, cars and horses. On pathways only for pedestrians, those running clockwise stay on the left side and counterclockwise on the far right side. There are two ‘icionic’ routes in Central Park: the ‘perimeter’ path, and a route incorporating the Reservoir. As the map shows, there are wonderful additional options — we recommend the Great Lawn and The Mall. Our routes generally start at the entrance to the Park in Columbus Circle, but clearly can be accessed from many spots. 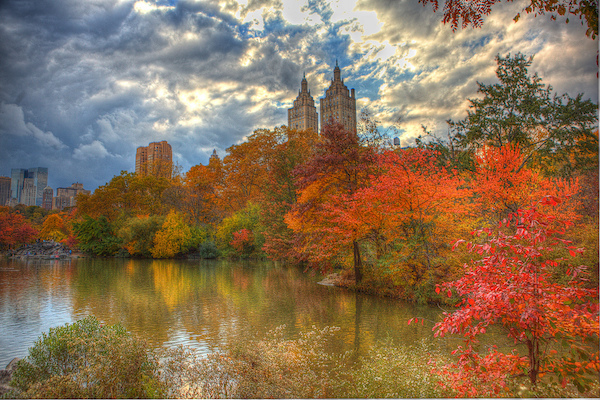 See the wonderful Central Park Running Map, courtesy of FunonFoot. 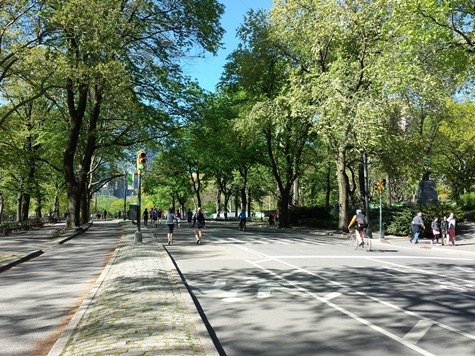 The full loop in Central Park is 6.1 miles and it includes some climbing. Run counterclockwise and you will encounter two major hills on your way; Cedar Hill (a.k.a. Cat Hill) and Harlem Hill. The South part of the park is the most crowded area, with the most crowds. Notable attractions include views of the Essex House, NY Athletic Club, Central Park Carousel, Sailboat Pond and Loeb Boathouse. One highlight, located at the entrance to Reservoir on East 90th Street, is a statue of the late founder of the NYC Marathon and New York Road Runners club. There are multiple access points from both sides of the park. One good option is to start at Columbus Circle, located at the southwest corner of the park, where also USS Maine statue is located. Run down a short path of approximately 500ft to get to the main loop. 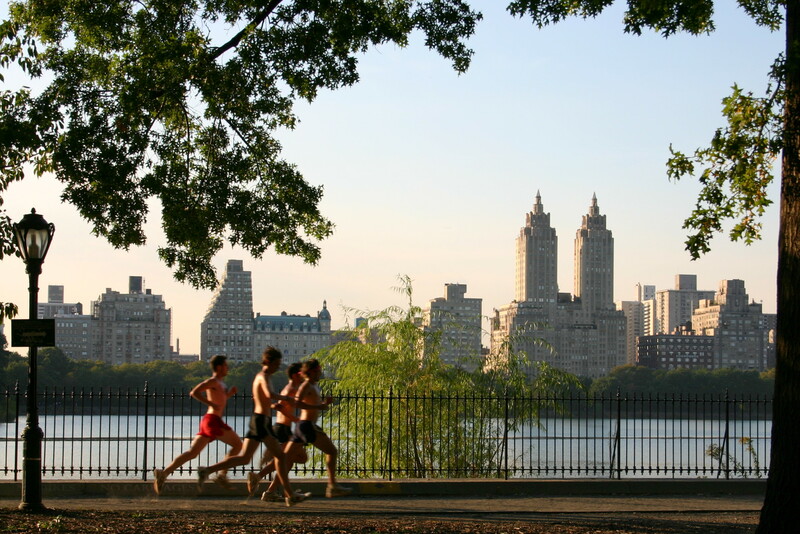 One of the most popular places to run in Central Park, and indeed anywhere, is the well-maintained dirt path that circles around the Jacqueline Kennedy Onassis Reservoir. Locals know this “loop” as Bridle Path. It was originally built for horses but is mainly used by walkers and runners. Along with knee-friendly surface and car/bike-free pathway, it offers picturesque lakefront views with Manhattan skyscrapers in the horizon. There are markings labeling every 100 yards and the loop around is 1.6 miles. There are multiple access points from both sides of the park, the most direct being the Engineer’s Gate on East 90th Street. Run counterclockwise and stay on the right side of the pathway. If you want to have a bit longer “loop”, try Full Bridle Path Loop, which is 2.5 miles and extends beyond the Reservoir, further north to the North Meadow fields and across the 102nd Street Transverse. It eventually rejoins the main Reservoir loop around West 93rd. A lot of thanks for your entire effort on this blog. My mother loves managing research and it’s simple to grasp why. Most of us know all concerning the dynamic means you create very useful ideas via your website and in addition strongly encourage response from some others on the subject then our own princess is actually discovering so much. Take pleasure in the remaining portion of the new year. You’re the one conducting a dazzling job. A lot of thanks for all your valuable hard work on this blog. Kim really loves conducting investigations and it’s really simple to grasp why. We notice all regarding the powerful tactic you convey both useful and interesting suggestions on the blog and as well as foster response from other ones about this content and my daughter is in fact learning a lot. Have fun with the rest of the new year. You’re conducting a fabulous job. First off I want to say excellent blog! I had a quick question in which I’d like to ask if you don’t mind. I was curious to know how you center yourself and clear your thoughts before writing. I have had a difficult time clearing my mind in getting my ideas out there. I truly do enjoy writing however it just seems like the first 10 to 15 minutes are lost simply just trying to figure out how to begin. Any ideas or hints? Thank you! Thanks for some other informative blog. Where else could I am getting that type of information written in such an ideal way? I’ve a challenge that I’m just now working on, and I’ve been at the glance out for such info. Hi, Neat post. There’s a problem along with your site in web explorer, could test this… IE nonetheless is the market leader and a big component to people will pass over your excellent writing due to this problem. Hello.This post was really motivating, particularly because I was browsing for thoughts on this issue last week. Thanks a lot for giving everyone remarkably superb opportunity to read articles and blog posts from this website. It is usually so pleasant and jam-packed with a lot of fun for me and my office colleagues to search your site not less than three times a week to read through the latest secrets you have got. Of course, I’m also actually amazed concerning the dazzling advice you serve. Certain 4 ideas on this page are basically the best we have all had. It’s in fact very difficult in this busy life to listen news on TV, so I simply use the web for that reason, and take the newest information.